How do you calculate THAC0? We're playing AD&D 1st edition and we have been asked by the DM to calculate our THAC0s so as to speed things up. So, I get what THAC0 stands for (To Hit Armour Class 0) but it's not something I ever used when playing way back when - we just pored over the to hit tables all the time, manually worked out adjustments and so on. So is there anything more to THAC0 than looking up what your roll to hit AC 0 in the DMG is? What modifiers would you apply? Yes, that's all there is to it. Modifiers are never applied to THAC0, so when figuring THAC0 based on 1st edition to-hit tables, all you have to do is look up the number you need to hit a target with AC 0. If you're using 2nd edition THAC0 numbers it's even easier: just write down the number for your class and level from table 53 (PHB p. 91) and you're done. "But certainly," I hear someone saying, "it's more complicated than that, isn't it?" Well, yes and no, but not for the reasons you expect. If you just need to derive a THAC0 number because your DM is streamlining* combat, then that's all you need to go forth and bash. THAC0 is a fixed number for a given level. It never changes except when your level changes. It never needs to be recalculated when you pick up a magic sword, because to-hit bonuses are applied to the d20 roll when you roll, not to the THAC0 on your sheet. An 11th-level fighter will always have a THAC0 of 10, no matter what other gear they've got. Similarly a 4th-level thief will always have a THAC0 of 19. So write down your THAC0 at 1st level (tip: it's going to be exactly 20), and every level check to see if you've moved over a column on the to-hit tables (or on the THAC0 table if using 2e's native THAC0 progressions, or just memorise the improvement rate) and earned an improved To Hit AC 0 number. Of course, there's more to the story for the curious. Yes, it's more complicated than that, but only because you're using THAC0 in a game of AD&D 1st edition, not because of how to modify THAC0. The interesting thing about THAC0 is that it's a strict mathematical progression. With a THAC0 of 20, you will always need to roll (after modifiers are applied to the dice) a 20 to hit AC 0 and a 24 to hit AC -4. This is not true using 1st edition to-hit tables. Similarly, you might have checked my numbers up there when I said that a 4th-level thief will always have an THAC0 of 19, and you might have said I was wrong. Well, 2nd edition thieves always have a THAC0 of 19 at 4th level because they have a 1 point per 2 levels progression rate, but a 4th-level thief in 1st edition needs a 20 to hit AC 0—they don't get the bump in their to-hit score until they get to use the "level 5-8" column for thieves. What? Yes, I know. 1st edition is just like that. So, when you ask if calculating THAC0 for a 1st edition character is as simple as looking up the number they need to hit AC 0 in the Attack Matrices, the answer is yes. But, when you consider that by using THAC0 instead of the matrices you're fundamentally altering the combat probabilities of your character, I need to add an appendix to my answer that kind of suggests it's not so simple. It's complicated, yes, but it's not the calculation that's complicated, it's the implications of using THAC0 derived from the Attack Matrices. 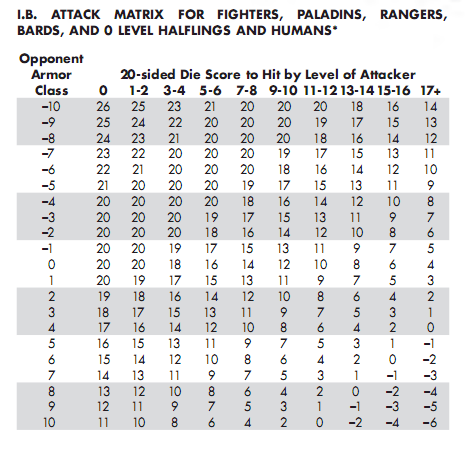 Really, it'd be so much simpler to just use the THAC0 table from 2nd edition wholesale instead of deriving it from the Attack Matrices, if your DM is going to insist on using THAC0. Either way though, once you've looked up the number and written it down, you're done! *It's arguable whether THAC0 streamlines or unnecessarily complicates combat. For some people the table look-up is faster and simpler, requiring no math after you've modified the roll, while working out a hit result using THAC0 requires doing two arithmetic operations, one of which likely includes subtraction (which it has been shown people do slower and with more errors than addition, even for small numbers). For others, they can work the formula in their head effortlessly, and looking up the table result requires too much time to crack open the book and find the right row and column. Which one you are will determine whether you love or hate THAC0. Myself, I've made peace with both and stick to THAC0 when playing 2e and Attack Matrices when playing 1e. Each class has a base THAC0, which is modified by their strength. A basic chart can be seen below. You then subtract your opponent's AC from your THAC0 to get your target number. So if my THAC0 is 15 (1st level fighter, 18(01) strength for a bonus of +3) and I'm fighting someone with 5 AC, 15 - 5 = 10, so I need a 10 to hit. The same basic system is used in D&D 3.x. 20 - your base THAC0 became your Base Attack Bonus, and your strength bonus adds to your base attack bonus. If you subtract a 3.x attack bonus from 20, you get your THAC0 from AD&D (roughly, there's no direct conversion possible between the two editions). An easier scheme exists for 1e and 2e. First you need to calculate the characters to hit bonus. You take 10 and subtract what they need to hit AC 10 (10 is worst chance of hitting AC 10 which is a 0 level character in AD&D 1st). Then in combat you roll a d20 add the to hit bonus and add the Monster's armor class if the roll totals 20 or more you hit. Your THAC0 will always be from your class & level as listed in the DMG. That number is static. To speed up the process of combat, your DM may be asking for your combat modifiers already added in. As an example: FTR 5 = THAC0 16(1st & 2nd ed). Then add you combat modifiers from ability scores, weapon spec/mastery, weapon of choice, and any other sources (such as an elf wielding a long sword, etc). Then just record your number for each weapon you are using. Example: Minotaur Ranger 8-ThAC013, plus STR 20( +3 to hit, +8 dmg), Weapon of Choice: Tetsu To(+1 to hit), weapon specialization 2 (+3 to hit, +3 to damage), two weapon fighting specialization (-0/-2 to hit). For a /matched pair +2 Tetsu To would be 13-3-1-3-0/-2-2 = THAC0 4/6. So on my character sheet I would write down: THAC0 13: matched +2 Tetsu To(THAC0 4/6, +13dmg) 1d12/3d6. Then do the same for your remaining weapons, all your numbers will be ready for you to look at at a glance so combat will go faster. In the case of hitting the poor -3 AC dragon, the above would only need a roll of 7/9. BTW, he was REALLY good at taking out all those pesky elves that were over running game worlds. Hope this helped. THAC0 is really the same as the BAB, just handled differently. You can do THAC0-d20 vs AC (if your THAC0 is 20, you need to roll 20 to hit AC 0 because it's 20-20 vs 0), or THAC0-AC vs d20 (in this case it's roll high). If you take THAC0 20 -10 you need to roll 10 or higher on d20, which is exactly like a BAB of +0 vs AC 10. The latter system works better when adding modifiers, because then it's THAC0-AC vs d20+(modifiers), and that's why d20 uses BAB as is instead of maintaining THAC0. It's fairly straight forward, but requires less dislike of algebra. It really is simple and combat goes really quickly if you apply your modifiers to your THAC0 ahead of time instead of to every die roll. A fifth level fighter with 17 strength, a +2 longsword, and a bless spell has a THAC0 of 12. Now 2e AD&D combat has all of the speed, fun, and energy of playing craps! "An orc in chainmail?! Daddy needs a 7!!!" Not the answer you're looking for? Browse other questions tagged adnd armor-class or ask your own question. How do you optimize in 1st Edition AD&D? How many encounters can you squeeze into a 3 hour slot? Are you immune to the fear generated by a creature after your first successful save? What is a hit die, and how do I calculate monster HP? How can we kill Demogorgon with a single fireball in 1st ed. AD&D? How is final AC calculated when you have a Natural AC and an Armored AC? How do I calculate DPR under my DM's crit house rule? How you calculate a warforged barbarian's AC?